Being healthy and eating real food does not mean you have to sacrifice all your favorite treats. My daughters love hot chocolate so I was determined to come up with a healthy homemade hot chocolate recipe our whole family would enjoy. 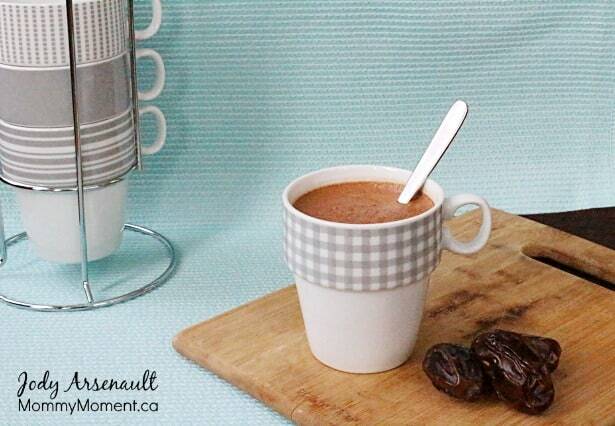 This healthy homemade hot chocolate is creamy and delicious. It is free of refined sugars and is dairy free as well. 2 tbsp raw organic cocao (raw cacao is rich in antioxidants. Do not confuse it with cocoa, it’s not the same thing). Blend on high speed for 5-6 minutes. When using a Vitamix the hot chocolate comes out nice and steamy. If yours is not hot, you can put it into a saucepan and heat till desired temperature. *You can use water or regular milk in place of the almond milk if you prefer. For a variation of this healthy homemade hot chocolate you can add some instant coffee grinds (or a whole coffee bean if using a Vitamix) to get a healthy mocha type drink! Need some other delicious drink ideas? You can check out my Delicious Drinks board on Pinterest and enjoy these other drink recipes below. Very creative! This sounds delicious and looks good too. Thanks Stacie! It is my favorite “treat” for sure! I love how it is packed full of antioxidants too. Ohhh, I love this! I’d feel less guilty making a cup of this! Thanks Tammi! This “hot chocolate” recipe has been a hit with my family and friends. Mmm. I’ve never thought to put coconut milk or dates in it!!! Thanks for the new treat. What a delicious looking recipe – I love the addition of the dates and coconut milk! YUM! Thank-you Jo-Anna. It is so delicious. Love that you’ve used coconut milk, lovely! Thanks Julie, I bet you would love it. Sounds great. I need to get a vitamix. Thanks Betty, it was so delicious! I love this recipe! I will have to try it. Sounds amazing and I have all the ingredients! 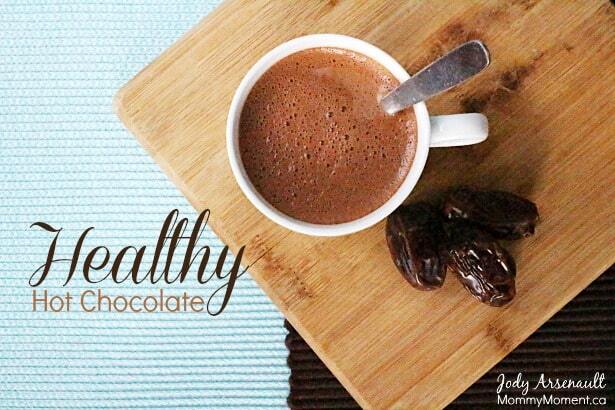 I never thought of this and hot chocolate is definately a drink I avoid, but this is a great healthy option. I will try it! This looks absolutely delicious Jody!!! Great photos as always!!!!!! Coconut milk is one of my favourite healthy ingredients; I’ll be making a healthier version of hot chocolate now. This looks really delicious without all the calories. Wow, my son asks for chocolate milk ALL the time, I should try making him this instead. Thanks for the awesome idea!! They are so amazing in this recipe, it’s a favorite here for sure! is there a taste of the coconut? that’s one thing I just cant seem to stomach is coconut. Chandra, there is actually not – it is so good!! Sounds interesting, would of never thought of putting dates in it. Thanks for the recipe, will have to give it a try! Wow this sounds so yummy, thank you for sharing. 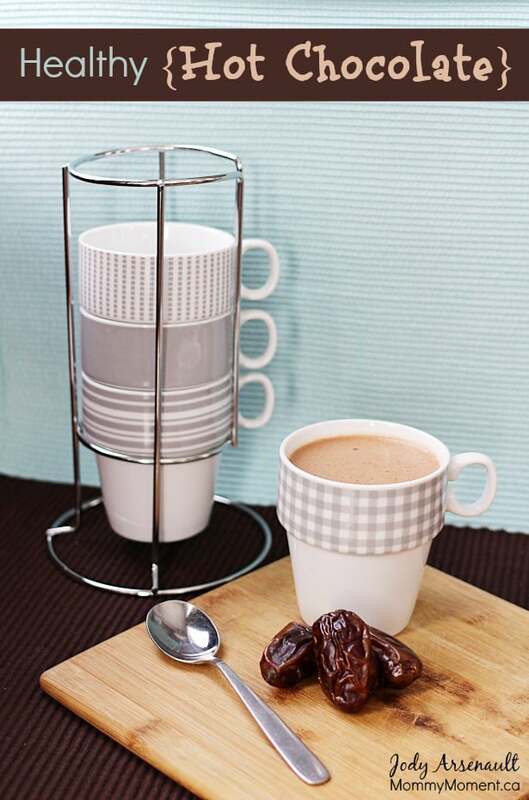 This looks like a great recipe I would never have thought of dates! I adore your cup holder-so cute! I stopped buying packaged hot chocolate a few years ago because I have allergies to sulphites (preservatives). I have my homemade chocolate recipe too but I would love to try your recipe…looks as though it is full of flavours! I’d love to hear what is in your recipe too! I have never attempted home made hot chocolate, and my girls love it. Your recipe makes me feel lazy. I stopped buying the package hot chocolate mixes because of food allergies. This recipe is from The South Beach Diet…warm milk with Frye’s Cocoa. I use natural sugar to taste. This is a very healthy gluten and dairy free recipe! I love that it doesn’t have any corn syrup either. And I already have a vitamix machine! I am going to try this. How sweet is it compared to the package mixes? Caryn, Because I do not eat refined sugar I find it sweet enough – Out of about 20 people who have tried this recipe only 1 person said they would like it a little sweeter. Hope that helps, thanks for your comment – you will have to let me know what you think of it after you make it. I LOVE it. 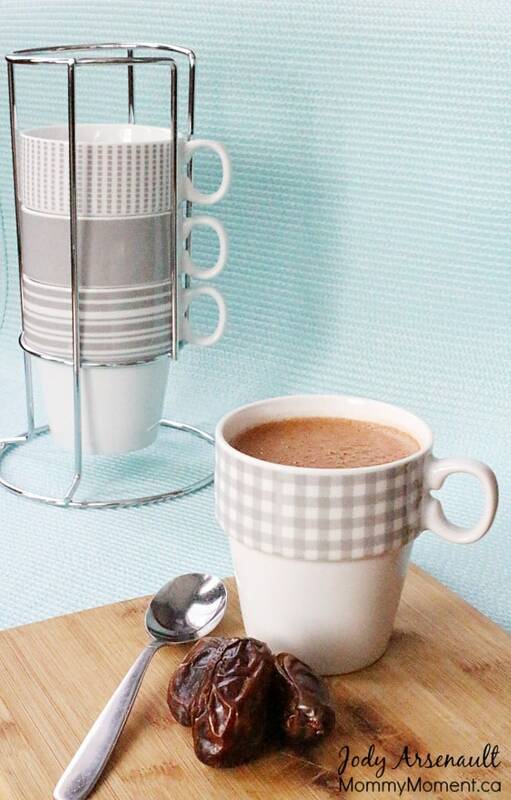 I love using coconut milk to make hot chocolate *yum! * Great to see this is becoming so popular! But….. there is no point using expensive raw cacao powder as the heating process destroys those precious enzymes of raw nutrients). So instead I use organic cacao powder. I use the raw cacao powder in my smoothies and non-baked items.